If you’re someone who spends a lot of time working in your garage workshop, you probably want the tools you use to be as quiet as possible. And, as someone who’s spent their fair share of time working in the garage, I like to keep it quiet not only for the sake of my neighbors but for my own sanity as well. Out of all the workshop tools you might need, air compressors are some of the hardest ones to soundproof. Because of that fact, I’ve decided to feature 5 brands that do a great job of providing us with the best quiet air compressors. Before I talk about some of the products I’ve been particularly impressed with, though, I should begin with a general explanation of what air compressors are and what you can use them for. After the basics, I’ll walk you through the features that you’ll want to keep in mind when you’re shopping for quiet air compressors. More importantly, after I present my findings, I’ll also talk about how you can make the air compressor you currently have as quiet as possible. There are many tools that can help you achieve different results when you power them with an air compressor. Professionals use them all the time! But how exactly does that work? How does the air compressor make and distribute the pressurized air? Naturally, compressors are powered by motors. There are different types of motors depending on the fuel and the way they work, but the gist remains the same. The motor powers the pump that takes in air and pushes it into a pressurized chamber or a tank. Usually, compressors have a gauge that tells you the PSI (pounds per square inch) pressure of the air inside. Air compressors also have regulator knobs that allow you to set the amount of pressure you want to dispense. For example, some paint spray guns work on 50 PSI — but others need 90 PSI. If the pressure is too high for the tool you’re using, it may actually explode. However, as versatile as air compressors are, they also have a major flaw. Like anything else that runs on a motor, many air compressors are just too loud to use in a confined space, especially without noise-canceling headphones. If this is the first time you’re learning about air compressors, you’re probably confused about the terminology. Some of it doesn’t really matter in the long run, but some of the specs you’ll see in my reviews can really make or break your future projects. As always, I’m now going to point out some of the most important features you’ll want to think about before you pick your air compressor. When I’m looking for quiet machines, my favorite products are the ones that have a noise estimate in their official descriptions. Still, not all of the products I’ve reviewed have a decibel noise estimate, so I do sometimes rely on videos and measurements from other users as well. In this case, most of the products we’ll be discussing do have reliable noise estimates. However, there are some other features that might help you determine the amount of noise you’ll be getting. Now, I should say that not all air compressors are made equal when it comes to noise levels. Most of the air compressors we’ll be looking at are reciprocating compressors. That means they are powered by a piston system, which actually isn’t the quietest option. After all, the piston connects to a crankshaft, so both of those parts produce significant up-and-down and side-to-side movements. In addition to the single-piston compressors, which have an output pressure of about 50–75 PSI, there are multi-stage compressors as well. Systems that operate on two or more pistons can avoid overheating while achieving an output pressure of 175 PSI. However, single-piston systems are still the most common ones for at-home use. On the other hand, if you were looking to avoid piston vibrations, you could also purchase a rotary compressor. Those compress the air by spinning adjustable rotary vanes that are positioned slightly off-center inside of a cylindrical motor. As the vanes spin the air that enters on one end, the chambers get smaller, expelling hot, pressurized air on the other end. If you’re like me, and you like to know exactly how all of your gadgets work, you can check out this YouTube video. When it comes to motors, the one thing you need to remember to check is whether the unit you’re looking at requires oil or not. While most of the compressors on my list are oil-free, plenty of the ones on the market still use oil. So what’s the difference between those two types of motors? Basically, if you choose a compressor that uses oil, you’re going to need to change it — usually on an annual basis. Air compressor oils are often synthetic products that don’t have any of the detergents that go into motor oil. For the purposes of lubricating compressor motors, you’ll also want to stick to a 30 or 20 weight oil, depending on the conditions. If the temperature where you live is below 34 degrees Fahrenheit or below freezing, you should choose an SAE 20 weight oil. Overall, oil-free models are typically much smaller and more portable than oil compressors. Besides that, they also require less maintenance, so they’re great for home use. That’s why a lot of the products on my list are oil-free. When you’re shopping for your compressor, you’ll also want to keep in mind the horsepower of the unit. As with most machines I’ve reviewed, weaker motors are usually quieter. Fortunately, if you’re just using a compressor to fix things around the house or for projects in your garage workshop, you don’t need a high horsepower product anyway. Once the pump draws the air into the machine, the air goes into a pressurized tank or chamber. So the next important feature you ought to consider when shopping for air compressors is the volume of the tank. Not only does the size of the tank affect the things you could use your compressor for, but it also affects its portability. More importantly, you should really focus on what you need the machine for before you decide on a size. The volume of a tank is typically measured in gallons, so you’ll see anything from 1 to 200-gallon tanks if you look around. Obviously, the larger units are more geared towards serious industrial uses, while the smaller ones are ideal for home use. Basically, the smaller tank sizes of 1–6 gallons should be able to inflate things, do a bit of stapling and nailing, and do small painting projects. However, models that offer upwards of 8 gallons and more will be able to handle more strenuous tasks such as bolting, painting large surfaces, cutting, grinding, and sanding. Ultimately, if you’re concerned with the amount of noise you’ll need to contend with, you should know that larger machines are usually louder. After all, large tanks require large motors, which do make more noise. So if you want to keep it down — get a modestly sized unit. Regardless of the type of motor you end up getting, most compressors need a certain amount of maintenance. Basically, when you put air under pressure, it heats up and liquifies. So no matter which compressor you purchase, you’ll have to empty the tank at the end of each day. Most tanks have a drain valve you can just open to let the liquid out after you finish using the device. If you don’t release the condensation, your tank will start rusting sooner rather than later. And if the tank rusts, it’s going to be structurally weak, which, in combination with the high air pressure, can lead to ruptures and even explosions. Let’s just say that knowing how to properly maintain an air compressor would be in your best interest. A word to the wise, though: expect to hear a loud hissing noise when you open the drain valve. After all, turning the valve basically depressurizes the tank as well, so the remaining air will be in a rush to escape. However, that’ll probably be the loudest sound you’ll hear coming from the products I’ll be reviewing. As I’ve already mentioned, most air compressors have a regulator knob that lets you change the PSI of the air you’re dispensing. The number that’s going to be especially important for you while you shop is the unit’s SCFM — the standard cubic feet per minute. That refers to the volume of air the machine can expel at a certain PSI under standard conditions. And that’s where it gets a bit tricky — after all, we don’t always use our compressors under standard atmospheric conditions. Still, there’s a rule of thumb you’ll need to follow if you want to use the SCFM measurement to choose your machine. If you need a compressor for continuous use, to spray paint, wash, or sand something, you’ll need a high SCFM. Even if you need to dispense the air at 50 PSI, that volume is going to be important for continuous use. On the other hand, if you’re going to be using the compressor for pneumatic staplers and nail guns, you won’t need as much volume. So lower SCFM would be just fine if you need a single punch of air, even if you’re using a tool that requires 90 PSI. When you start using your compressor, you should keep in mind that the length and the diameter of the hose you’re using to connect it to your pneumatic tool will also affect your air volume. Air that needs to go through several feet of a narrow tube will lose more pressure than air that goes through a wider, shorter passage. The final feature I want to point out is the general construction of the air compressor. These types of products come in many shapes and sizes — and I’ve already explained how that can affect their usage. However, in this case, I want to call your attention to another significant feature: portability. Most of the 1–6-gallon compressors on the market are designed with portability in mind. Basically, you’ll be able to just pick them up and take them with you wherever you go. However, if you choose a unit with a bigger tank — say, a 60-gallon one — you’ll need to have it bolted in place in your workshop. The way an air compressor looks can also be an important factor in its noise production. For example, the kinds of compressors that need to be bolted down to the floor usually have metal feet. In that case, I recommend purchasing anti-vibration pads to keep the unit from causing a ruckus against the hard cement floor in your garage. Alternately, smaller models typically have small rubber feet that usually do a great job of preventing vibrations. What’s more, some compressors also have wheels and handles, so you can drag them around. Now that I’ve laid out the most important features you’ll need to look out for, we can finally talk about some of the best brands in the business. These are the five companies that have been doing their best to supply us with the quietest machines. In the following product reviews, I’ll take a closer look at each company’s 1 or 6-gallon machine, and then create a brief overview of the other products in their lineup. So without further ado, let’s check out the goods! The CAT 1610SQ stands at just under 14 inches and is about 16 inches wide, as well as 13 inches deep. It’s supposed to only make 65 decibels of noise, which is fairly reasonable, in my opinion. However, the amount of noise it makes is closer to 30 decibels from about a foot away. So that’s about as quiet as a motor can be. Speaking of which, this machine runs on an oil-free electric motor, so it will require less maintenance. As I’ve said before, you’ll have to release the condensation after use, but not much else. This product features a 1.6-gallon tank and weighs in at about 35 pounds. The design incorporates a padded handle, which should make it fairly easy to take it from room to room if you’re doing home repairs. The design of the product is very clean and straightforward. The pressure gauge for the tank is on the left side of the front panel, with the regulator knob in the center and the regulator gauge on the right. There are also 2 quarter-inch universal quick connectors right above the regulator knob. The motor is powerful enough at 1-horsepower induction while it’s running and 2 horsepower at peak performance. In optimal conditions, you should get about 3 cubic feet per minute at 40 PSI of pressure. However, if you need to power a 90 PSI tool, you’ll only have 2 CFM. The maximum pressure you’ll be able to get is 120 PSI, and the tank only takes about a minute to fill up thanks to the dual-piston pump. California Air Tools certainly have some of the quietest air compressors on the market, which is largely due to the brushless induction motors they use. When I was researching their roster of products, I decided that it would be best to feature one of the smallest units they offer. After all, smaller devices typically have smaller motors, so they tend to be quieter. However, the company has many other options to choose from. If you’re working with a tool that requires continuous and highly pressurized air, like a sander, you’ll want to use a device with more impressive specs. Depending on your needs, you could purchase this 4.6-gallon dual-tank unit or even a 10-gallon one if you really need it. In fact, the 10-gallon compressor actually has large wheels and a handle that make it really easy to cart around. There’s even a 15-gallon unit that makes only 70 decibels of noise. However, in my opinion, one compressor stands out if you want a nearly silent machine with a medium-sized tank. California Air Tools actually have an 8-gallon model that has a soundproof housing cabinet. That product also has four swivel wheels so that you can easily transport it, and it makes only 40 decibels of noise. So that’s the real winner here. On the other hand, if you’re looking for the smallest compressor in the lineup, they do have a 1-gallon unit. Even if you need to use it frequently, the 56 decibels of noise this little guy makes shouldn’t bother you at all. But if you often find yourself in need of a more powerful air compressor, I’d say to go for the 8-gallon one. Everyone knows about the DeWalt brand — they make some of my favorite power tools and equipment. I’ve even recommended a few of their tools in my article about making a soundproof generator box. So it should come as no surprise that they are behind some of my favorite air compressors as well. In the interest of fairness, I’ve decided to review the product that’s the most similar to the 1.6-gallon CAT compressor. The smallest compressor in the DeWalt lineup is the 1-gallon oil-free unit — so let’s take a look at that one. Right off the bat, one of the most notable things about this machine is its black and yellow color scheme. Those are the colors DeWalt machines are famous for — while CAT products are all serviceable and gray. This product is very compact, measuring at just about 15 inches wide, 8 inches tall and 19 inches deep. The whole thing weighs only 24 pounds, and it has a convenient carry handle right next to the tank. Overall, this compressor has everything you need it to have, between the tank pressure gauge and the regulation knob and gauge. It even has rubber feet that absorb the vibrations. However, unlike the CAT product I reviewed, this compressor only has a single connector. Furthermore, this machine can achieve an airflow of about 0.75 CFM at 90 PSI. The maximum pressure you’ll be able to get is 135 PSI, which is more than what the CAT compressor can manage. Despite its small size, this model is pretty powerful, so it does make a bit of noise. However, it shouldn’t go above 71 decibels. I’ve already mentioned the smallest air compressor in the DeWalt lineup, so let’s talk about some of the more substantial units. While we’re in the smaller category, you can check out their 2.5-gallon cordless compressor. The device is definitely louder than the 1-gallon one, making about 79 dbA (A-weight decibels) of noise. It also looks completely unique, with a pancake-style tank and a black frame that also houses the battery that powers its brushless motor. If you’re planning on using your air compressor to power even more demanding tools, you could also purchase a 6-gallon unit. DeWalt makes two types of products of this size. The first one is a pancake compressor, which looks like a flattened ball, while the second has a horizontal tank with wheels and a handle. Additionally, the horizontal version also has an oil-lubricated pump, so you’ll need to keep that in mind if you decide to get it. Unfortunately, DeWalt doesn’t offer anything like the CAT soundproof cabinet I recommended earlier. However, they do have plenty of more industrial models that might prove useful — especially if you build a soundproof box for them. For example, they have a horizontal, oil-free 20-gallon unit as well as a vertical, oil-lubricated model with a 20-gallon tank. Similarly, they have a vertical, oil-free 30-gallon compressor and an oil compressor of that size. Even though these machines are very large and weigh up to 190 pounds, you’d still be able to cart them around thanks to the large wheels and comfortable handles. On the other hand, if you’d like to install a stationary compressor in your garage, you could get their 60-gallon oil compressor. Just remember to slip an anti-vibration pad under each of the metal feet before you bolt them down. I cannot talk about quiet air compressors without mentioning some of the ones Makita makes. Their teal-colored products are not only instantly recognizable but also pretty quiet. As always, though, the smallest of the bunch is probably going to have the quietest motor. So I’ve decided to write my close-up review about their 1-gallon oil-free air compressor. First of all, I want to discuss the design of this item because it really is a masterpiece. Some of the products I’ve already mentioned also have this kind of a protective metal frame around the main motor and the compressor tank — but I do believe Makita did it best. The compact 23-pound unit even has a convenient handle and four rubber feet to absorb excess vibrations. However, since the device only makes 72 dbA of noise, you’d probably be fine even without the anti-vibration pads. Additionally, the front of the device also contains everything you’re used to seeing. So it has the tank, regulation pressure gauges and the regulation knob, as well as the air output connector. Furthermore, the compressor has a 1/6-horsepower induction motor that provides a maximum of 125 PSI of air pressure. The CFM volume is 0.58 at 40 PSI or 0.45 at 90 PSI. At those numbers, you can be sure that this little guy will be great for household projects. However, if you’re looking for something that’s going to be able to fill your tires or power a nailer, you might want to take a look at the other products in the Makita lineup. Unlike DeWalt, Makita doesn’t really make overly large air compressors. However, the ones they do have tend to be well designed and thought-through. Take, for example, their 1.6-gallon. It only offers a slightly larger tank than the product I just reviewed — but it’s completely different than the 1-gallon unit. Now, I have no doubt that many people would be glad to use a smaller device simply because it’s cheaper. But if you need something stronger with a maximum pressure of 400 PSI, this might be the device for you. Thanks to the dual capacity couplers, you’d even be able to use high-pressure nailers at 2.7 CFM (at 300 PSI). Makita also makes oil-lubricated compressors like their 2.6-gallon unit. That one is a great choice if you want something that will last you a good long while. Then there are also twin-tank oil compressors like their 4.2-gallon model. If you look at these products side by side, you’ll see that they’ve made each of them unique. Perhaps that individual attention to detail is the most apparent in their largest compressors — the oil-lubricated 5.2-gallon one and the oil-free twin-tank 10-gallon model. Both of these devices look completely novel when you compare them to products from the same and other brands. However, it’s not just about looks — it’s about the performance you get out of these machines. And trust me: these two will definitely get you through some tough projects. Even though the Campbell Hausfeld company makes many different workshop tools, I’d say that they consistently outdo themselves with their air compressors. Their Quiet Compressor series of products has been one of my personal favorites for several years now. I’ll talk about the entire series in a minute, but for now, let’s look at the 1.3-gallon unit. This suitcase-style compressor is perfectly built to protect the tank and the motor inside the frame. It’s 24 inches long, 14 inches wide, and about 8.5 inches thick. At 29 pounds, it should be pretty easy to pick it up by the handle and take it wherever you need it. What’s more, the metal frame of the compressor also has rubberized padding that will absorb the vibrations of the motor and protect it when you store it in an upright position. Despite the compressor’s size, it can fill up the tank pretty quickly thanks to the dual-piston pump system. Additionally, the manufacturer claims that the components of the machine are even more durable than their previous compressors. The Quiet series is also supposed to be half as loud as their regular compressors. Generally, these units produce about 68 dbA of noise. As with the other small units I’ve listed, you shouldn’t expect to use a sander with this compressor. However, it’ll perform just fine if you need to fill up a basketball or do a bit of painting, stapling, and fastening. If you can spring for a 2 or 4-gallon compressor instead of a 1-gallon unit, you definitely should. In the Quiet series alone, Campbell Hausfeld actually has only 4 models. Right above the 1-gallon one, you have the 4.6-gallon dual-tank version that also has two connectors so that you can hook up two tools. Then, there’s the 6-gallon pancake compressor that also has two couplers and a dual-piston pump. Lastly, they also make an 8-gallon horizontal tank version with the same specs. The manufacturer claims that all of the compressors in this series produce the same amount of noise — 68 dbA. However, if you need something more substantial, you can also get one of the other Campbell Hausfeld products. For example, their vertical 26-gallon oil-free compressor would be perfect for more demanding projects. Whether you’re painting or sanding, you’d be able to rely on this product. And, thanks to its large wheels and handle, you could position it wherever you want. On the other hand, if you’re looking for an even more impressive unit, they also have stationary 80-gallon oil compressors. Still, if you’re not shopping for a business, you really won’t need these larger models. The reason I’m so partial to Campbell Hausfeld is that they make it a point to educate their customers. When I had to get a new compressor a few years ago, I learned a lot from their educational Youtube video. So if you’re still confused about anything we’ve talked about in this buying guide, I recommend checking that one out. Finally, the last brand I want to feature on my list is Senco. They don’t have a huge range of air compressors, but the ones they do have are generally fairly quiet and affordable. As always, the first product I’ll review is the smallest one in their roster — the 1-gallon compressor. The noise that the unit makes measures in at about 68 dbA, which is great for home use. When it comes to portability, you really can’t get better than these small devices. This one has a 10-inch wide horizontal tank and a sturdy handle that will allow you to easily carry the 20-pound machine. It comes with everything you need it to have, including the pressure gauges, the regulator knob, and the universal coupler. What’s more, it also has small rubber feet that might absorb some of the vibrations. Overall, the oil-free pump is just powerful enough to produce a maximum of 125 PSI of pressurized air. The motor usually runs on .5-horsepower, but it can also achieve 1 horsepower. Ultimately, this Senco model is certainly one of the cheapest and quietest ones on the market. However, I’d always rather get something that’s a bit more expensive and more user-friendly. As it is, this gray machine looks a bit too complicated for someone who’d only need it for small projects. As I’ve previously mentioned, Senco doesn’t actually have many air compressor models in their lineup. However, the ones they do have are generally pretty great. Take, for example, their dual-tank 2.5-gallon oil-free model. The 1.5-horsepower motor enables the machine to produce a maximum of 135 PSI of pressurized air. Once again, the unit is small enough and light enough (at about 40 pounds) to take from room to room. And it even has the familiar handle and rubber feet construction. Similarly to their 2.5-gallon unit, their 4.3-gallon model also has twin tanks — although it is an oil-lubricated compressor. Best of all, the machine can deliver 4.3 CFM of air volume at 100 PSI of pressure. Lastly, the largest model in the Senco air compressor line is the 6-gallon pancake model. This one is a favorite of mine because of its clean design and overall usability. It even has two couplers, so you can use it to power two tools at the same time. It’s also pretty affordable for the size of the unit. However, if you’re looking for an entirely soundless machine, this might not be the one for you. Specifically, I’m not sure that I trust the rubber feet to absorb excess vibrations. Still, you could always pad the floor under the device with rubber. Or you could just set it on a folded old carpet or blanket. Most of the air compressors I’ve mentioned were specifically designed to run quietly. However, some of them will never be able to be as quiet as you need them to be. Instead of risking your neighbors’ rage, you should do everything in your power to keep the noise at a minimum. So let’s talk about some of the ways you might do that. Throughout my reviews, I’ve made it a point to mention how you could use anti-vibration mats to quiet your compressor. After all, one of the main reasons they make such a huge racket is because their motor makes them vibrate against the floor. So that’s where anti-vibration mats come in. If you need rubber anti-vibration mats, something like this 0.75-inch mat from casa pura would be perfect. However, in my experience, an old blanket or a rug will work just as well. It’s just that rubber is always a good choice because you wouldn’t be risking overheating it since it’s heat-resistant. In addition to padding the floor with rubber, you can also use it on the compressor itself. Specifically, you can create a rubber case — or something like a soundproof generator box. Whether you pad the inside of the box with insulation or with a thick layer of rubber, the amount of noise you’re hearing should significantly decrease. Basically, you would be making something similar to the soundproof cabinet the 8-gallon CAT compressor has. If you wanted to, you could also install swivel wheels on the bottom side of the box. What’s more, you could always use one of the other techniques I described in my article about quieting loud generators. Like with generators, one of the most important things here will be to allow the machine to breathe. That will prevent overheating. However, leaving holes in the soundproof box will also allow the noise to escape. Still, any padding would be better than no padding at all. Another thing you could do is put rubber on the motor itself. If you’ve noticed that your compressor is making excess noise by shaking the metal screws and bolts, you can always unscrew the individual parts and install rubber grommets at the joints. Just remember to unplug the machine before you start tinkering with it! This video showed me another interesting use of rubber for muffling air compressor noise. In it, a guy used an automotive muffler and two air hoses to quiet the intake of his compressor. However, that technique would pretty much only work on large, stationary compressors. After all, the small models already have unpredictable CFM volumes and PSI. That’s why adding a long hose would almost certainly impair their functionality. On the other hand, if you have a stronger machine, you’d even be able to move it outside to reduce the amount of noise you can hear inside. Finally, if you can’t afford to get an entirely new compressor that’s already as quiet as it can be, the best you can do is use your own machine on low power. However, as this is often impossible, all you can do is move the compressor further away from you while you work and hope for the best. Ultimately, the only way to ensure a quiet performance is to get a less powerful compressor. So if you need an 80-gallon tank for work purposes, you probably won’t be able to make it very quiet. So there you have it! 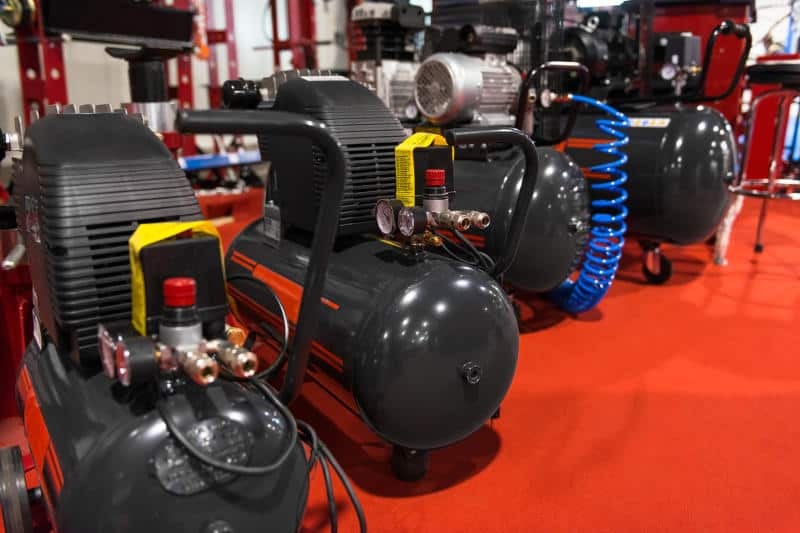 Whether you’re a casual handyman or a dedicated carpenter, you’re sure to find the perfect air compressor for your needs among the ones I’ve mentioned here. If you often find yourself having to perform home repairs or inflate your tires, I recommend going for the CAT 8-gallon model with the soundproof cabinet. It is the most powerful and the quietest of the units I’ve come across. Nevertheless, that’s not to say that the other brands I’ve mentioned don’t make plenty of great compressors as well. Ultimately, if you don’t need to use a sander or a paint spray gun, you won’t need anything larger than a 1-gallon compressor. However, if you need a more powerful tool — you can’t really expect it to be quiet. So you’ll need to create the right conditions for the compressor before you run it. Hopefully, this article has gotten you thinking about the ways you can do that.